In this update we see the addition of a very handy new feature, the Multi Uploader. With the addition of this new feature you are now able upload images directly from Windows Explorer. This means no more having to open a browser, navigate to Imageshack, browse for the image and finally upload it. A previous update that wasn’t posted included the Autosave option. If you plan on taking multiple screenshots you can automatically save them to a specified directory. 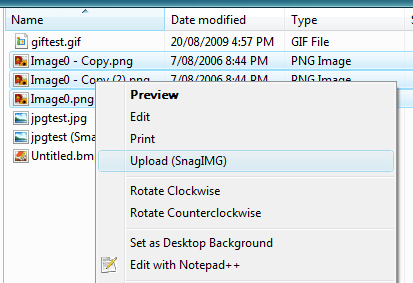 To enable Autosave simply right click the SnagIMG system tray icon. + ADD: The system tray icon now changes if SnagIMG is disabled. + ADD: SnagIMG will now check for updates on startup. + ADD: New option in Settings to disable update check on startup. + FIX: Panning in the Viewer should now work correctly. + FIX: Few glitches fixed with the Drag Screenshot feature. + FIX: No longer crashes on startup after reboot/logoff. + CHANGE: Update process is now a little more automated. + CHANGE: You can now open multiple instances of the Viewer. To update, either right click the SnagIMG system tray icon and check for updates or go to the downloads section.